This staple is anything but simple, and it’s enjoying a resurgence in popularity. ITALIANS SPEAK WITH their hands and cook with their hearts. They’ll invite you into their kitchens to watch them cook and feed you until you feel like a stuffed pig. Italians might be the most generous cooks around, until it comes to their recipes. My family sneaks in an ingredient (or two) when you turn your back so you can never make it as tasty as theirs. As a Fustanio and a Cavalcanti I know this trick well. My uncle adds a pinch of sugar and my stepfather a pat of butter to finish off the family ragout, another word for marinara sauce. I learned to improvise in the kitchen thanks to them. Meatballs, like marinara sauce, are sacred in my house. There are a million different ways to make them and when they have the right meat blend, spices, and juiciness, each bite unlocks a journey down memory lane for me to a family dinner, where there were sometimes arguments about whose meatballs were best. It is no wonder meatballs are gaining traction in cities—New York has a chain of restaurants called The Meatball Shop with six locations. Jackson may be a little behind big-city trends, but our valley still has a lot of love here for the homestyle meatball. “My family isn’t as crazy with the whole meatball thing,” says Paul Cucchiarelli, the newest meatball chef in town at Hand Fire Pizza. Still, he says, “I don’t know if I can share the full recipe.” Once we get talking, he pretty much dishes the ingredients of his “meat bawl” pizza, a name that stuck after he and his business partner made fun of the way he pronounced meatball with his New England accent. Cucchiarelli, who often grabs a bag of beef on his way to work, lives on the Hereford Ranch and rents space for Hand Fire Pizza in the old Teton Theater, an iconic Town Square art deco building owned by the Gills, the same family who owns and runs the Hereford Ranch. 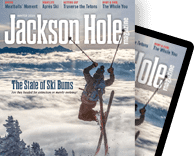 He formerly had restaurants in New York City and Maui and when he met his wife, who lived in Salt Lake City, they moved to Jackson Hole together. With a little more probing he tells me he uses organic breadcrumbs and fennel, one of my favorite spices in my stepfather’s recipe. On Tuesdays, Cucchiarelli donates a portion of every pizza to a nonprofit in the community. Also on Tuesdays, Creekside Market & Deli’s sandwich special is a meatball sub. Bochicchio grew up learning the recipe in his mom’s kitchen and his first job was at a deli like his before he became the chef at Snake River Brewing. In 2006 he bought his own deli, Creekside. At home he sometimes mixes beef with pork and makes them larger than the one-ounce portion he makes for deli sandwiches. At Creekside he sticks to pork only because he says pork has a lot more moisture than beef. He sears each meatball before he bakes it, another important step in my family’s recipe, which calls for ground beef, pork, and veal. “When you overcook meatballs, you are rendering out all the fat,” says Nick Phillips, the owner of Sweet Cheeks Meats, a butcher shop where you can buy several different iterations of meatballs to cook on your own. “The meat will be dry and firm. If there is too much fat in the meatball it will fall apart.” Phillips sometimes makes his meatballs out of a mixture of lamb and beef and sometimes he makes them using only beef. He also makes a Moroccan-inspired lamb merguez meatball using Sweet Cheeks’ homemade harissa spice blend. “Gluten helps hold them together, forming a bond inside,” he says. Unlike town’s other meatballs, Phillips’ are cooked in a smoker. He tells his customers not to turn their backs on them when they reheat them in the oven. These images of the Bochicchio family remind me of a similar tradition in my family—Papa pasta. As you might guess, it was served with meatballs. When he was alive, Papa would dish up the rigs (rigatoni) one plate at a time, schmearing a ladle of sauce on the bottom and pouring two more on top of one or two gigantic meatballs. We called his servings “dog-choking portions.” He would tell us to eat it while it was hot, wipe the sweat from his brow and be the last one to sit down, often still wearing his marinara-stained white apron. The photos of Papa teaching his grandchildren to make meatballs are some of my most precious memories of him. I’ll never eat Papa’s pasta and meatballs again, so whenever meatballs are on the menu at restaurants like Local Restaurant & Bar, Calico Restaurant and Bar, Il Villaggio Osteria, and Bin22, I order them. 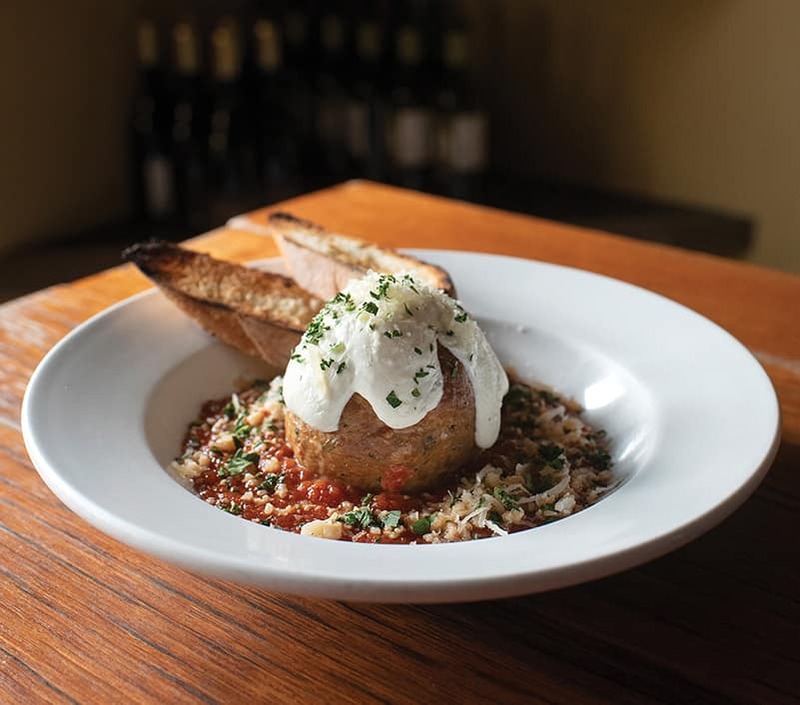 During the busy season, Bin22 sells more than sixty meatballs topped with fresh mozzarella from Vermont per night. Bin22’s recipe, as with most great Italian recipes, is simple: ground beef, pork, egg, milk, homemade breadcrumbs made with Persephone bread, fresh parsley, fresh oregano, garlic, salt, and pepper. “I think the secret is we do it fresh,” says Bin22 chef Luis Hernandez. “They stay soft, tasty, and really good to eat.” The meatball of Hernandez’s youth came from his mom who lives in Mexico City. It has hard-boiled eggs, rice, and cilantro and is just as dear to him as the memories of meatballs of my youth are to me.